In 2015, Rachel Notley’s NDP brought down a Progressive Conservative dynasty that had been entrenched for more than four decades. Regardless of what happened next, her victory—which moved the NDP from four seats in the legislature to a majority government—was always going to be one of her crowning accomplishments. 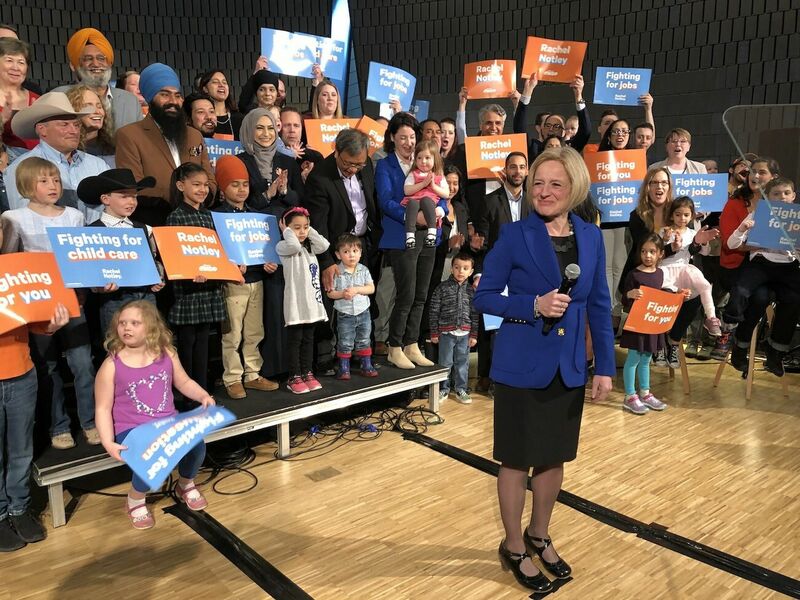 On April 16, Notley and her government will be judged on what’s happened since: their successes as well as their failures and missed opportunities. Robyn Luff rode Notley’s orange wave into the legislature in 2015 as the MLA for Calgary-East. Four years later she is leaving Edmonton as an independent. Luff admits she only met Notley a few times, and despite leaving the NDP caucus alleging bullying by party leadership, she still says Notley is smart, kind and funny. Rachel Notley, when she was in opposition, was a pretty unapologetic New Democrat. She was critical of the oil industry, she was critical of the elite in Alberta. As a teacher getting into the political ring, Luff was relieved to see work by the NDP on gay-straight alliances (GSAs), a new look at the curriculum and the reduction in school fees. But she had hoped to see more progress on initiatives such as implementing earlier screening for learning disabilities, which now only occurs in Grade 3. She also hoped to see the NDP make good on their promise to pull back funding for private schools. Here’s a closer look at how Notley has handled three key issues during her first term. In 2015, Notley went to Paris to represent Alberta in the forming of the Paris Agreement—an international interim plan that aims to keep the planet below two degrees of warming. So where are we three and a half years later? Canada is failing to meet its commitments—and Alberta is a big part of that. In Paris, Canada vowed that by 2030, the country will have decreased emissions by 30% over 2005 levels. 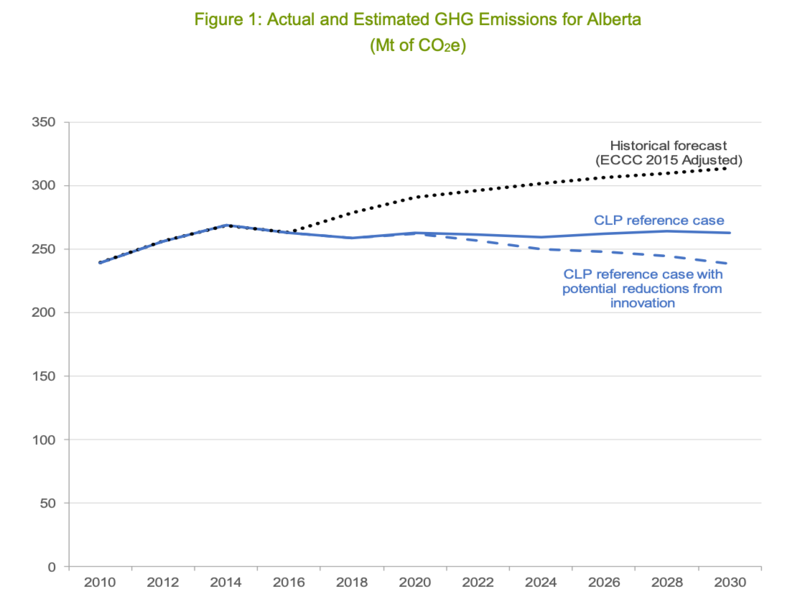 But in the best case scenario under Alberta’s Climate Leadership Plan, the forecast for emissions in 2030 would be 238 megatonnes of CO2 equivalent annually—an increase of 2.2% over 2005 levels. But that doesn’t mean Notley’s action on climate change—largely centred around the carbon tax—hasn’t been successful on other fronts. The NDP’s Climate Leadership Plan began to scrub the tar stain from Alberta’s reputation, as renewable energy contracts were signed and Energy Efficiency Alberta was created. But Notley was tasked with balancing a fossil-fueled economy and her environmental goals—a difficult tightrope to walk. It meant on one hand she implemented a carbon tax, but on the other she lauded and pushed for more pipelines. In 2018 Notley made the call to abandon the national climate plan after the Trans Mountain pipeline expansion hit yet another snag. Andrew Weaver watched Notley’s policies closely from B.C. Weaver is leader of that province’s Green Party, but before he was a politician, he was a climate scientist and one of the lead authors of the report from the Intergovernmental Panel on Climate Change in 2007, when the group was awarded a Nobel Peace Prize. “I think there will be a debate after Notley’s term is over—and I don’t know how she’s going to do here—about whether or not she missed an opportunity to have gone further,” Weaver said in an interview. “I look at Notley and I say, ‘You did some good work with respect to coal-fired electricity plants. You did some good work with respect to your carbon pricing,’” Weaver said. Then came the ever significant but. I think there will be a debate after Notley’s term is over — and I don’t know how she’s going to do here — about whether or not she missed an opportunity to have gone further. Weaver suggests that Notley’s push for the Trans Mountain pipeline expansion was misguided. Instead, if she wanted to be climate conscious and energy-job focused at the same time, Energy East should have been her hill to die on, he said, since that pipeline would have kept refining jobs in Canada. The NDP did cap oil sands emissions, but they capped it at 100 megatonnes of CO2 equivalent per year, whereas the oil sands only emit about 70 megatonnes currently, allowing for significant expansion. Amanda Jensen remembers watching Notley’s victory speech on TV in 2015. It was the only recent election in which Jensen remembers casting a ballot. Frustration over how things were run by the Progressive Conservatives pushed her to vote for an orange alternative. Little did she know that less than two years later she would be knocking on the door of the NDP and offering herself up as a poster child for why employment standard changes were needed in Alberta. When I met Jensen in early 2017, she was fresh off a divorce and trying to keep a roof over her four kids’ heads despite having been let go from her job. 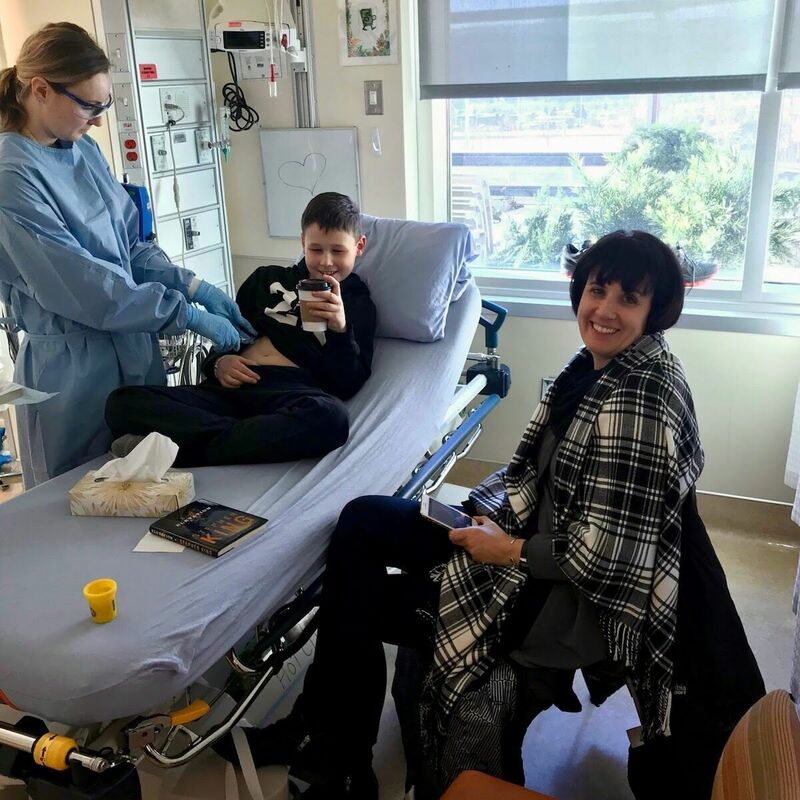 She’d only just begun to grapple with the heart wrenching news that her six-year-old son Jake had leukemia. On top of all she was dealing with, she now had to fit countless trips to Calgary into her schedule for Jake’s treatment. In Alberta at the time, there was no job-protected leave for this kind of scenario—which is what led to Jensen being fired. Alberta lagged behind the rest of the country when it came to other employment standards as well, including parental leave, overtime pay and vacation time. The legislation hadn’t been updated for three decades under previous PC governments. After hearing Jensen’s story, the NDP used her as a public example for why this was a problem. Within months, Jensen and her family were invited up to Edmonton for the first reading of the Fair and Family Friendly Workplace Act in the legislature, which saw 36 weeks of protected leave instituted for parents caring for critically-ill children, among other job protections. Certainly it’s been an active government that’s looked a little bit more like Lougheed in terms of the kinds and the rate of change that it brought in compared to previous governments. Bringing employment standards and workplace safety codes in line with national benchmarks are examples of how Notley “modernized” Alberta, says Mount Royal University political scientist Lori Williams. “Some of those are controversial, some of those might be too fast for some Albertans, but certainly it’s been an active government that’s looked a little bit more like [former Alberta premier Peter] Lougheed in terms of the kinds and the rate of change that it brought in compared to previous governments,” she said. Notley's labour reforms, including raising the province’s minimum wage to $15 per hour, sparked debate, but none brought the contention to a boil the way the changes to farmworkers safety did. Bill 6 brought people with pitchforks to the steps of the legislature, protesting the bill that would bring farmhands under the same umbrella of workers safety and compensation as workers in other industries. For people like Jensen, though, the NDP’s labour reforms were overdue. In her campaign ads, Notley highlights the importance of prioritizing the wellbeing of children. Numbers released by Statistics Canada earlier this year show that the percentage of Albertans under the age of 18 living under the low income threshold dropped from 10% to 5% since 2015, when the NDP took office. But the NDP’s work on this file isn’t all sunshine and rainbows. In 2016, the province’s Office of the Child and Youth Advocate (OCYA) issued the Voices for Change report, which focused on the disproportionate number of Indigenous kids in the welfare system. Despite only 9% of children in Alberta being of Indigenous heritage, they represent about 70% of kids in provincial care. “This is their failure,” said Donald Langford, executive director of Métis Child and Family Services in Edmonton. My frustration is that we’ve gone from residential schools, to the Sixties Scoop… and they just continue the process. Really nothing has changed. They’re still taking our children. After Klein left office, Langford said, that style of management was lost. Since April 1, 2015—roughly the time that the NDP came to power—110 children have died while in the care of the province or while their families were being observed by provincial workers. About half of those kids were Indigenous. The deaths include 14 suicides, 26 accidents and six homicides. The problem might not have been of the NDP’s making, Langford says, but they’ve done little to significantly improve the situation. After the 2016 Voices for Change report was released, Notley said her government would implement all of its recommendations. “We need to roll up our sleeves to make better and faster progress on how to improve the quality of service and the quality of relationships,” she told CBC in 2016. Allow the Indigenous community to make the decisions on how our families are going to be treated, how they’re going to be looked after. The OCYA tracks progress on each of the eight recommendations they made in 2016. None of them have been completely met at this point, though six have seen “significant progress” made. To Langford, this is the heart of the problem.